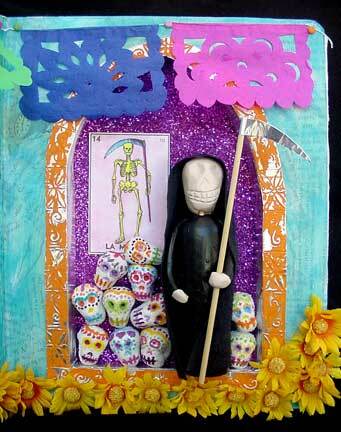 I have finally finished my three books for Dia de los Muertos – The Day of the Dead. 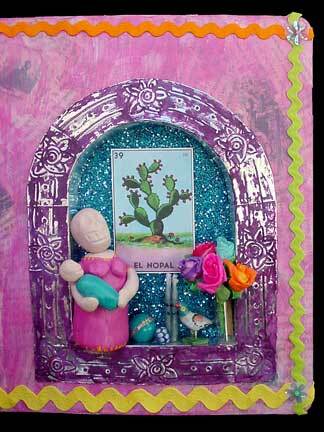 You can see more pictures of them on my web site at Dia de los Muertos :: Dia de los Muertos Altered Books. 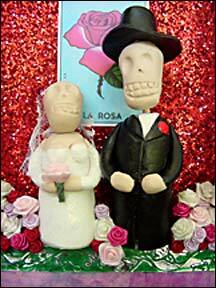 I started creating these books because I wanted to enter a juried exhibition for art related to the Day of the Dead, but I found out about it too late. I foolishly thought I could complete the books before the deadline, but I wasn’t able to. I’m hoping to enter them in a more local art show. The deadline for that one is August 27, so I might be able to get all the entry stuff done by then. One of the things I need to do is get slides made. I have never done this before. I can’t afford to have professional photos taken, so I found a place online that will take my digital pix and turn them into 2″ x 2″ slides. The company is fairly local, too, which is nice. I think the hardest part about making these altered books is trying to make each one look unique but also complementary to each other. I spent a lot of time researching the holiday, looking at pictures of Dia de los Muertos altars, and viewing examples of Mexican textiles to get ideas for patterns and colors. All that was a lot of fun, but it was also time consuming. I would do something on the book, say, glue down the bark paper on the covers, and then hop onto the computer while the paper dried. I spent one whole day just looking for pictures of Loteria cards online. I found some places where people had uploaded scanned images of the cards, but when I tried to print them, the resolution of the pix was so low that they looked miserably fuzzy. No matter how I tried to tweak them, I just wasn’t satisfied. After hours of frustration, it occurred to me that perhaps they would carry the Loteria game at a Mexican market. I had an idea where one might be located, but when I drove by the next day I discovered it was a Filipino market. I was pretty disappointed and headed for home when I happened to see a Mexican market further down the road. I went inside. My son and I were the only non-Latino people shopping. We walked up and down the isle looking at all the interesting foods and packagings. Finally I got to a section with hats, knives, and Mexican flags. Tucked away on the shelf below some folded up sports bags were three different versions of the game. And they were a lot cheaper than I had seen them online. I was so excited. Another time consuming part of the process was scanning the text and images from my antique Spanish Reader to use in the background on the books. I scanned the pages I wanted, removed the color, adjusted the brightness/contrast, and did a lot of touching up before I was able to print them out. Then I had to prepare the brown rice paper so it would print in my Epson printer without jamming it. That was also quite a process. After I was finished with the books I decided to put some of the scans I used on my web site on my Public Domain Images page. The three pages of engravings can be found at Victorian Clipart :: Clipart Victorian, Free Victorian Clipart, and Vintage Clipart. I had the most fun making the little skeleton figurines for the niches. I hadn’t worked with my polymer clay for a while, so it was a bit of an ordeal to pull out the boxes and dig through looking for colors I could use. I was determined not to buy anymore clay. Luckily I found quite a bit of white, but since I knew that it wouldn’t be enough, I also added ecru and raw sienna to the mix. I wanted to keep the skeletons very pale–almost white–but I but too much of the brown in and so they came out a peachy beige color. At first I thought that I’d paint them white, but I liked them the way they were, and also, since I was going to paint a bridal dress on one of them, I worried about a lack of contrast between the bones and the dress. So I decided to keep them ecru colored. I also chose not to paint in the eyes and teeth, unlike all of the other examples of skeletons that I’ve seen. I like the subtle, understated look. And to tell the truth, I was worried that I would mess them up if I tried to paint them in. So I kept them “au naturale,” so to speak. I would have to say that it took me about three weeks of steady, off-and-on work to complete these books, and then two more days to photograph them and prepare the web pages. Now that they’re finished, I feel a momentary sense of relief, but I have several more projects waiting in the wings, nagging at me to be created. So as soon as I finish/start cleaning up my workroom, it’s on to my next piece of art . . .